The history of Cincinnati Bearcats vs Ohio State Buckeyes in basketball is…well it’s not there. Despite Cincinnati and Columbus being in the same state, just a couple hours drive apart, there have been just 10 games ALL TIME between the two schools, with seven coming in the regular season and only one regular season meeting since 1921. On Wednesday night you can add an 11th meeting as the Bearcats re-open their on campus arena and welcome the Buckeyes for the first time since 1920. From 1905-1921 (yes, that long ago), these teams met 6 times, with Ohio State holding a 4-2 edge. 1921. Ohio State won 35-13 (what?) on January 3, 1920, in what was the last meeting between the two schools in Cincinnati. As the Bearcats re-open their on campus arena on Wednesday, it is expected that they will re-hang their banners and honor their previous accomplishments. That includes their two championship banners from 1961 and 1962, both wins came against Ohio State. Amazingly for Cincinnati, these championships came in the years immediately following the legendary Oscar Robertson’s graduation. Coming into the 1961 championship game, the Buckeyes were the defending national champions and prohibitive favorites with a 27-0 record. The roster included future Hall of Famers Jerry Lucas and John Havlicek and the well known Bobby Knight, who came off the bench. It truly is incredible that the two most prominent basketball schools in Ohio could go 98 years without playing at one’s school. Since than, they have met three teams in NCAA tournament games and one time in the regular season. The regular season game in 2006 was pretty much a joke, as the team’s took part in the Wooden Tradition Classic in Indianapolis. It was a joke because this was Mick Cronin’s first year at Cincinnati and he was fielding a team with one four-year scholarship player. The rest of the team was filled with hard-playing, heart-filled junior college transfers. The Buckeyes cruised to a 72-50 victory, which wasn’t really that close. Future #1 draft pick Greg Oden has 14 points and 11 rebounds. Mike Conley had 8 points, 8 rebounds, 7 assists. The most notable player for Cincinnati is NFL defensive end (currently with the NY Giants) Connor Barwin, who scored 2 points on 1-5 shooting and grabbed 3 rebounds. The most recent game was an 81-69 Ohio State victory in the Sweet 16 of the 2012 NCAA tournament. That was Mick Cronin’s second time making the tournament at UC and his only Sweet 16 appearance to date. That OSU team would go on to advance to the Final Four (and lose to Kansas). Jared Sullinger had 23 points, 11 rebounds Deshaun Thomas led all scorers with 24 points and the ever annoying Aaron Craft has 11 points, 5 assists, 6 steals, 4 rebounds in a very impressive performance. Cincinnati got everything they could out of a team that ran out of gas – Cashmere Wright (playing on no knees) led the team with 18 points. Sean Kilpatrick (most recently with the Chicago Bulls at the end of the 2018 NBA season) had 15 points and well-known Yancy Gates had 7 points, 5 rebounds. 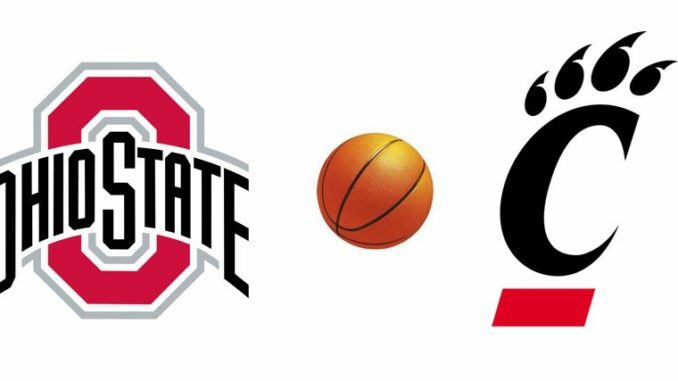 Both teams made the 2018 NCAA tournament – Cincinnati a 2 seed and Ohio State a 5 seed. Neither team made it past the round of 32. For the Bearcats, three of their leading players from that team are gone – Gary Clark, Jacob Evans, and Kyle Washington. That production will need to be replaced by Jarron Cumberland, Cane Broome and a handful of young, unproven guys who seem poised to step up. For Ohio State, they lose Keita Bates-Diop. CJ Jackson and Kaleb Wesson are amongst their top returning players. Both teams enter this game and this season with lots of question marks, some unproven players in bigger roles and lower expectations than a year ago. For Cincinnati, here are 10 things to be excited about in preparation for the 2018-19 season. For more Cincinnati Bearcats and college basketball talk, follow me on twitter @msschneid and instagram @mikedropsports.